To the person responsible for this outrageous act: Way to make your predominantly white political party look like the worst possible stereotypes of its relationship with people of color. CNN has confirmed yesterday's reports that two people were removed from the Republican National Convention Tuesday after they threw nuts at an African-American CNN camera operator, saying, "This is how we feed animals." Multiple witnesses observed the exchange and RNC security and police immediately removed the two people from the Tampa Bay Times Forum. The convention released a statement saying, "Two attendees tonight exhibited deplorable behavior. Their conduct was inexcusable and unacceptable. This kind of behavior will not be tolerated." CNN also acknowledged the incident, saying, "CNN can confirm there was an incident directed at an employee inside the Tampa Bay Times Forum earlier this afternoon. 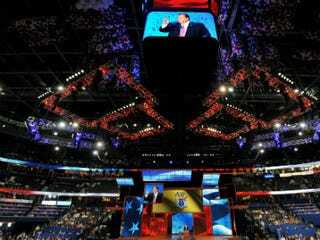 CNN worked with convention officials to address this matter and will have no further comment." The truth is, the actions of one crazed and racist convention attendee aren't very meaningful when it comes to the relevance of the party to people of color in the United States. GOP positions on issues surrounding health care, the economy and education — and how they affect black and brown people — won't get as many headlines as the nuts that were thrown in Tampa, Fla., yesterday, but they're arguably every bit as troubling.